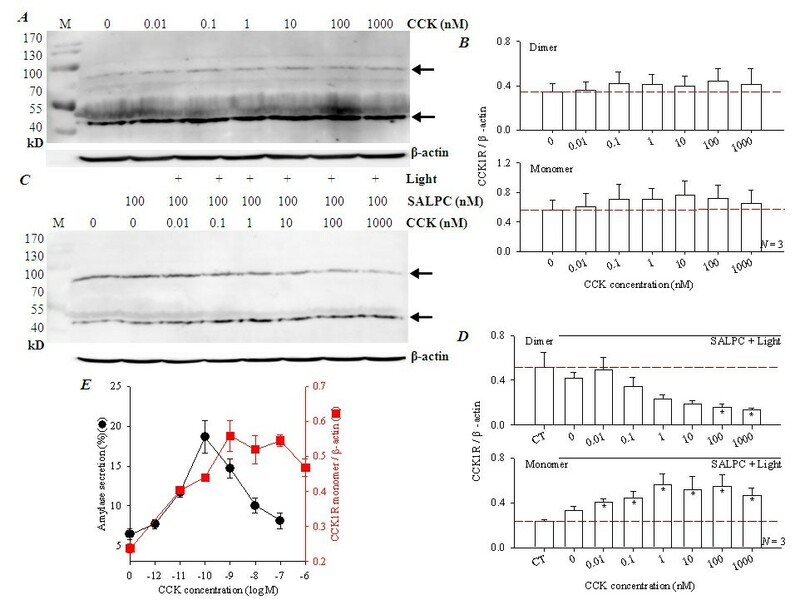 Liu JS, Cui ZJ (2019) Pancreatic stellate cells serve as a brake mechanism on pancreatic acinar cell calcium signaling modulated by methionine sulfoxide reductase expression. Cells 8: 109. 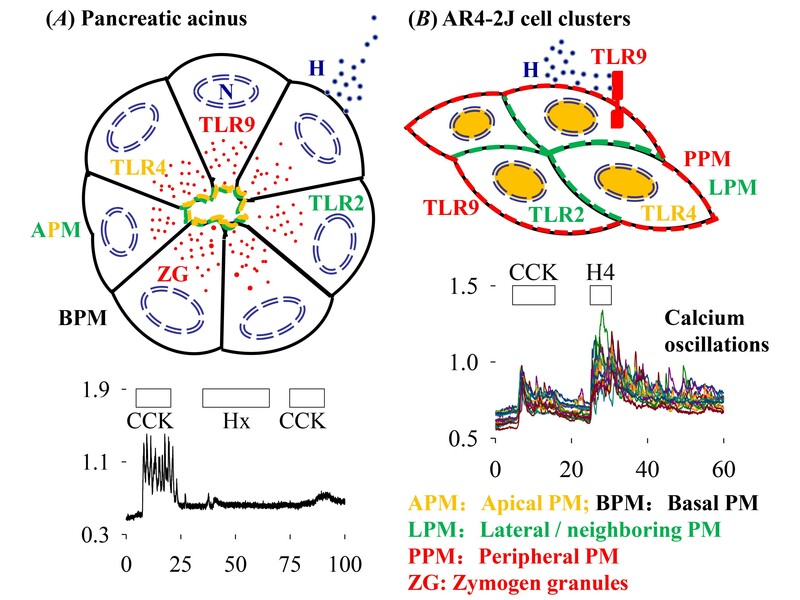 Guo HY, Cui ZJ (2019) Extracellular histones activate TLR9 to induce calcium oscillations in rat pancreatic acinar tumor cell AR4-2J. Cells 8: 3. Jiang WY, Li Y, Li ZY, Cui ZJ (2018) Permanent photodynamic cholecystokinin 1 receptor activation – dimer-to-monomer conversion. Cell Mol Neurobiol 38: 1283-1292. Jiang HN, Li Y, Jiang WY, Cui ZJ (2018) Cholecystokinin 1 receptor - a unique G protein-coupled receptor activated by singlet oxygen (GPCR-ABSO). Front Physiol 9: 497. 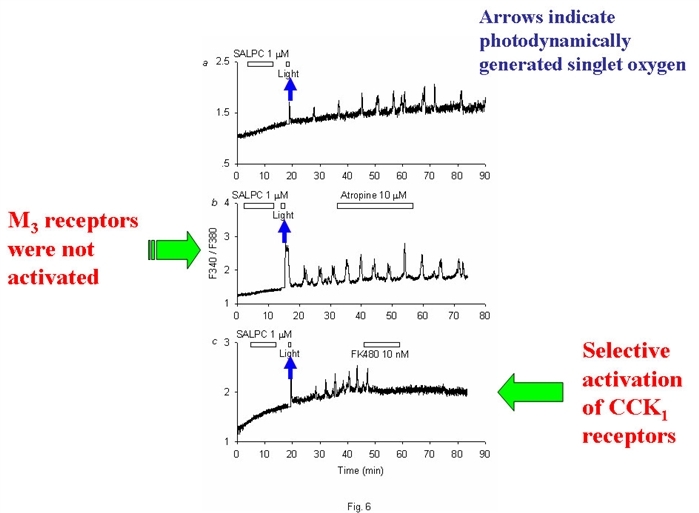 Jiang HN, Li Y, Cui ZJ (2017) Photodynamic physiology - photonanomanipulations in cellular physiologywith protein photosensitisers. Front Physiol 8: 191. Li ZY, Jiang WY, Cui ZJ (2015) An essential role for NAD(P)H oxidase 2 inUVA-induced calcium oscillations in mast cells. Photochem Photobiol Sci 14: 414-428. Liang HY, Song ZM, Cui ZJ (2013) Lasting inhibition of receptor-mediated calcium oscillations in pancreaticacini by neutrophil respiratory burst - a novel mechanism for secretoryblockade in acute pancreatitis? BiochemBiophys Res Commun 437: 361-367. Cui ZJ, Han ZQ, Li ZY (2012) Modulating protein activity and cellular function by methionine residue oxidation. Amino Acids 43: 505-517. Jia YH, Cui ZJ (2011) Tri-phasic modulation of ACh- and NE-maintained calcium plateau by high potassium in isolated mouse submandibular granular convoluted tubular cells. Arch Oral Biol 56: 1347-1355. Fang XF, Cui ZJ (2011) The anti-botulism triterpenoid toosendanin elicits calcium increase and exocytosis in rat sensory neurons. Cell Mol Neurobiol 31: 1151-1162. Duan YJ, Liang HY, Jin WJ, Cui ZJ (2011) Substance P conjugated to CdTe quantum dot triggers cytosolic calcium oscillations and induces QD internalization in the pancreatic carcinoma cell line AR4-2J. Analyt Bioanalyt Chem 400: 2995-3003. Chen BD, Guan DD, Cui ZJ, Wang X & Shen X (2010) Thioredoxin 1 downregulates MCP-1 secretion and expression in human endothelial cells by suppressing nuclear translocation of activator protein 1 and redox factor-1. Am J Physiol Cell Physiol 298: C1170-C1179. 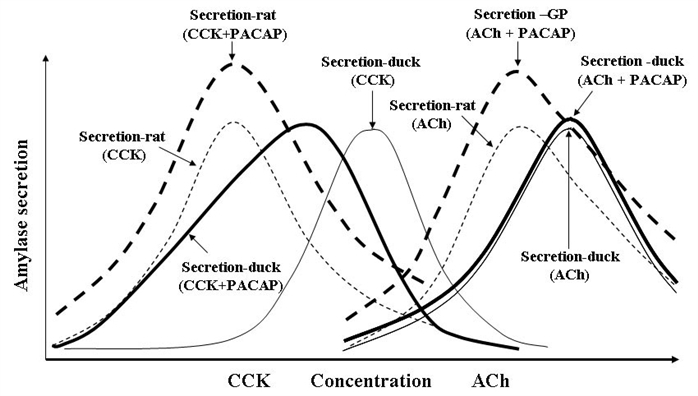 Wang BJ, Liang HY & Cui ZJ (2009) Duck pancreatic acinar cell as a unique model for independent cholinergic stimulation-secretion coupling. Cell Mol Neurobiol 29: 747-756. Hu F, Sun WW, Zhao XT, Cui ZJ & Yang WX (2008) TRPV1 mediates cell death in rat synovial fibroblasts through calcium entry-dependent ROS production and mitochondrial depolarization. Biochem Biophys Res Commun 369: 989-993. Wang BJ & Cui ZJ (2007) How does cholecystokinin stimulate exocrine pancreatic secretion? From birds, rodents, to humans. Am J Physiol 292: R666-R678. 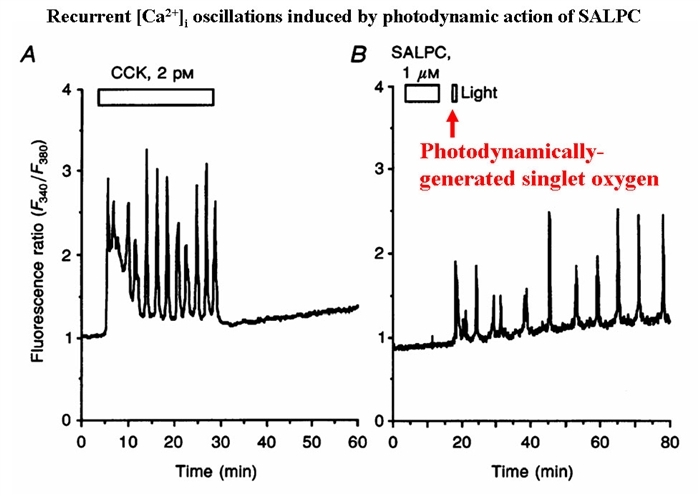 Ma CY & Cui ZJ (2004) Selective use of a reserved mechanism for inducing calcium oscillations. Cell Signal 16: 1435-1440. Cui ZJ, Zhou YD, Satoh Y & Habara Y (2003) A physiological role for protoporphyrin IX photodynamic action in the rat Harderian gland? Act Physiol Scand 179: 149-154. An YP, Xiao R, Cui H & Cui ZJ (2003) Selective activation by photodynamic action of cholecystokinin receptor in the freshly isolated rat pancreatic acini. Br J Pharmacol 139: 872-880. Professor in Cell Biology, Beijing Normal University, 1998- present. A Short-Term Fellowship from The HFSP, 1996. The China Ministry of Education Trans-Century Talent Programme, 1998. Young Scientist Merrit Award, NSFC, 1998. A Special Stipend from The Chinese State Council, 1999. Editorial boards: Prog Physiol Sci, Biophysics Reports (Associate Editor), Pancreapedia. Formerly Council Member, Chinese Society for Cell Biology, Chinese Biophysical Society. Past President, Chinese Commission for Photobiology (a section of The Chinese Biophysical Society). Undergraduate course (Nationally Acclaimed Course): Human and Animal Physiology. Among the earliest responses after cellular stimulation is increase in cytosolic calcium concentration. Such calcium increases in individual cells are often in the form of oscillations - periodic increases in cytoslic calcium concentrtion. Oscillation confers two forms of modultion of the calcium signal: amplitude modultion (AM), and frequency modultion (FM), therefore multiple calcium signals could be encoded, to modulate specific cellular functions. Our laboratory investigates in secretory and other cell types the molecular mechanisms of calcium oscillations, such as a role for NCX, ER calcium channels in the pace-making process of calcium oscillations. Secretory cells are pivotal in the body. Secretory cells such as pancreatic acinar cells, pancreatic islet beta cells, anterior pituitary cells, mamary gland acinar cells, after stimulation by neurotransmitters or hormones all have their secretory granules in the cytosol to dock at, and fuse with, the plasma membrane, subsequently to release the granule content into the extracellular space. Our laboratory investigates how after stimulation, secretory cells have their secretory granules dock at, and fuse with plasma membrane, to complete the process of exocytosis and cell secretion, with an emphasis on SNARE and related proteins. Many chromophores (photon-absorbing groups) in nature could absorb photons of certain wavelength. When such molecules after absorption of photons transfer their photon energy to molecular oxygen, the excited delta singlet oxygen is produced. Since singlet oxygen has very high chemical energy (94 kJ/mole), and a very short lifetime in cellular environment (１μs), it has very limited distance of effective reaction (< 10 nm). Therefore singlet oxygen generated during a Type II photodynamic action could subcellular specifically modulate cellular functions. Our laboratory investigates molecular targets of photodynamic action in alive cells, and the resultant chemical modifications of biologically important signalling macromolecules. We also investigate the molecular basis of singlet oxygen action as an endogenous signalling molecule. To examine the cellular and molecular effects of toosendanin on synaptic transmission. To investigate regulation by neutrophil respiratory burst, pancreatic stellate cell activation on pancreatic acinar calcium signalling. 3/ CERTIFICATES FOR ENGLISH LEVEL. Li ZY, Jiang WY, Cui ZJ (2015) An essential role forNAD(P)H oxidase 2 inUVA-induced calcium oscillations in mast cells. Photochem Photobiol Sci 14: 414-428. Cui ZJ, Han ZQ, Li ZY (2012) Modulating protein acvitity and cellular function by methionine residue oxidation. Amino Acids 43: 505-517. 1/ 2010-2012, Cytosolic calcium oscillations in rat mast cells. 2/ 2013-2016, Neutrophil regulation of calcium signalling in pancreatic acini. 3/ 2017-2020, Protein photosensitizer photodynamic regulation of GPCR. 4/ 2011-2015, Spatial and Temporal Regulation of Cell Calcium Signal. 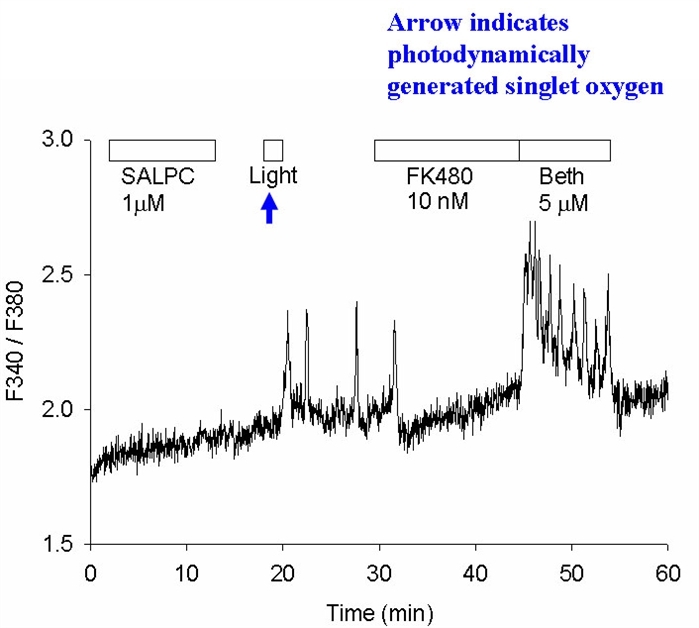 CCK1R either in AR4-2J cells, or ectopically expressed could all be permanently activated by singlet oxygen generated by photodynamic action with either chemical photosensitiser SALPC or genetically encoded protein photosensitiser KillerRed or miniSOG. Further, CCK1R fusion expressed with either KillerRed or miniSOG are also permanently activated after light irradiation. From: Jiang HN, Li Y, Jiang WY, Cui ZJ (2018) Cholecystokinin 1 receptor - a unique G protein-coupled receptor activated by singlet oxygen (GPCR-ABSO). Front Physiol 9： 497. 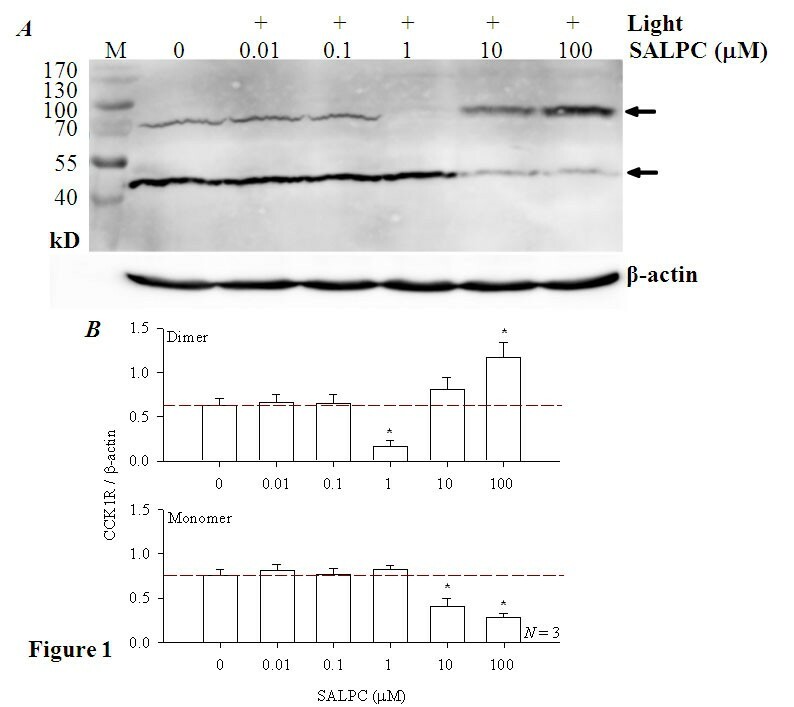 CCK1R protein extracted from isolated rat pancreatic acini, are quantitatively converted from dimer to monomers by SALPC photodynamic action. From: Jiang WY, Li Y, Li ZY, Cui ZJ (2018) Permanent photodynamic cholecystokinin 1 receptor activation – dimer-to-monomer conversion. Cell Mol Neurobiol 38: 1283-1292. 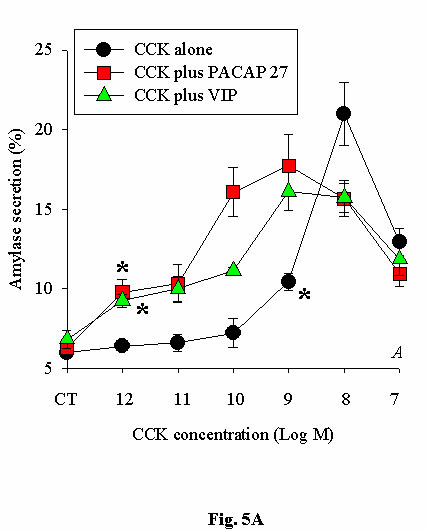 Although no such conversion is observed after CCK stimualtion, subthreshold photodynamic action plus CCK revealed a "Bell-Shaped" CCK dose response curve which is very similar to CCK-stimulated amylase release from isolated rat pancreatic acini. 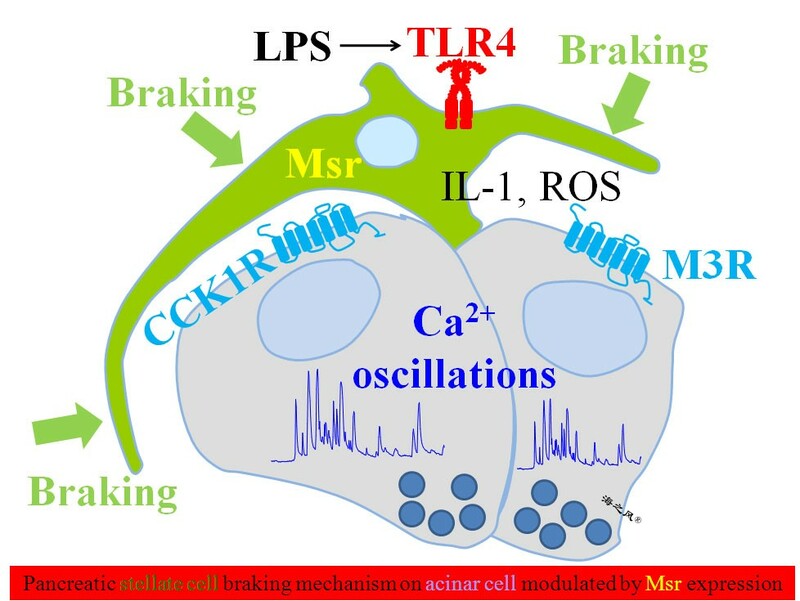 From: Guo HY, Cui ZJ (2019) Extracellular histones activate TLR9 to induce calcium oscillations in rat pancreatic acinar tumor cell AR4-2J. Cells 8: 3. 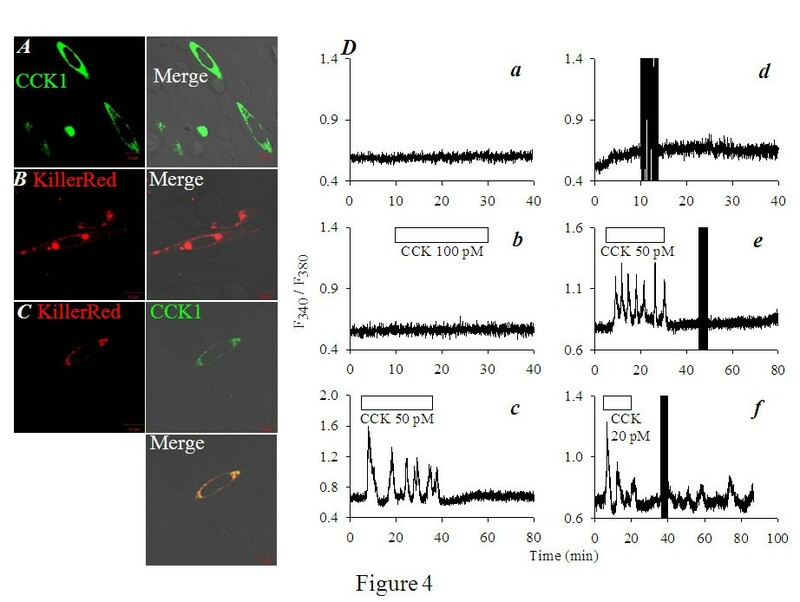 From: Liu JS, Cui ZJ (2019) Pancreatic stellate cells serve as a brake mechanism on pancreaticnacinar cell calcium signaling modulated by methionine sulfoxide reductase expression. Cells 8: 109.